The vast majority of land in Arlington is reserved for the construction of single-family homes, and affordable housing advocates argue that’s going to have to change if the county wants to adequately handle the region’s looming, Amazon-inspired population influx. 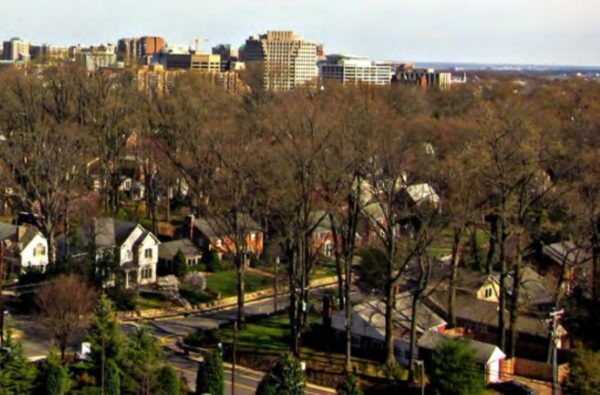 A new report released by the Northern Virginia Affordable Housing Alliance last week argues that Amazon’s decision to bring 25,000 jobs to Arlington in the coming years “should create a regional sense of urgency and commitment to address our housing supply and affordability gap,” a sentiment broadly shared among local and state leaders following the company’s momentous announcement. But where the advocacy group strikes a starker tone than other observers is in its policy prescriptions for meeting that challenge. The NVAHA’s researchers point to data showing that about 86.7 percent of land in Arlington is zoned exclusively to allow new single-family homes, compared to just under 12 percent where multifamily development, like apartment buildings, is permitted. They believe that sort of zoning scheme not only chokes off the county’s ability to add more housing, and meet its current supply pressures, but also cuts off the potential for people of more modest means to ever move into the county’s more affluent neighborhoods. Accordingly, the group sees the clear potential for “allowing more diverse housing types in detached single family neighborhoods,” reversing the current paradigm where the “path of least resistance” for developers is simply to build ever-larger single-family homes in those areas. The NVAHA acknowledges that there is indeed a role for local governments to subsidize the creation of housing that is guaranteed to remain affordable in order to reach the poorest renters, or to prioritize the preservation of existing affordable homes. But the advocates also stress that the “disproportionate number of higher-income earners” moving into the area means that market realities will make it difficult for county officials and other leaders to build enough housing on their own. That means relying on more private development, they say, while working to ensure that developers don’t only build high-end apartments that are out of reach for people in lower income brackets. “By-right development should be liberalized to streamline the costly entitlement process and promote more naturally affordable building types and development scales,” the researchers wrote. They suggest that duplexes, townhomes and other small apartment complexes could be housing options for the county to consider, and they do note that the county has done some work in this area with its strategies to promote the creation of “accessory dwelling units.” Arlington officials did take some steps to allow smaller apartments attached to larger homes, commonly known as “mother-in-law suites,” but the NVAHA sees room for more bold changes on the issue. The researchers note that discussions around creating more “missing middle” housing, to fill the gap between subsidized affordable units and luxury homes, often concentrate that the new homes “around transportation corridors or the areas near existing mid-density or mixed-use neighborhoods.” Instead, they see a need for more “diversification” of new housing types all across the different regions of the county. Of course, the advocates would concede that Arlington won’t be able to solve the housing affordability problem on its own, particularly as officials expect that Amazon’s workers will choose to live around the entire region. Accordingly, they urged leaders from across D.C., Maryland and the rest of Northern Virginia to confront the issue together.